Stir the diced butter into the beaten Nulaid eggs. Add an extra nugget of butter and a little oil to a pan and place over heat. When the pan is warm, pour the egg mixture into the pan and cook briefly on medium-high heat, about 20 seconds. Turn the heat lower and with a small spatula start to gently push the mixture away from the sides of the pan while tilting the pan so that the uncooked egg can run onto the surface of the pan. Continue doing this until the egg is no longer runny, yet still creamy and moist. Season to taste and then sprinkle with the cheese, basil and tomato dice. 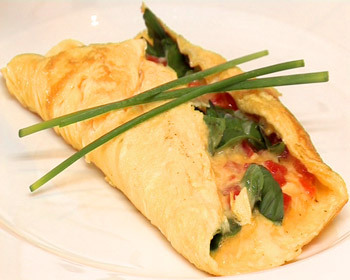 Fold two of the sides of the omelette towards the centre and continue to cook for a few seconds longer to warm the filing. Tilt the omelette pan almost upside down over a serving plate and allow the omelette to slide onto the plate. Garnish and serve immediately. Pour about 6 cm of water into a large pan and bring to a soft boil. Reduce the heat a little to prevent the water from boiling rapidly as this will cause the whites to detach from the yolks while poaching too fast and becoming rubbery. Now add the vinegar, which will help set the whites more easily. Crack an egg into a cup. Hold the cup near the surface of the water and gently drop the egg into the water. With a spoon, nudge the egg white closer to the yolk to help the white adhere better to the yolk. Quickly continue doing the same with the rest of the eggs. In between additions, gently spoon some of the simmering liquid over the eggs to cook the tops evenly. 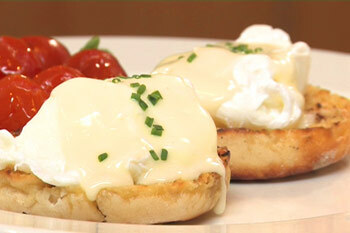 Poach the eggs according to your own taste: about 3 minutes for a soft yolk and up to 5 minutes for a firm yolk. Remove the cooked eggs with a slotted spoon and dab the bottom of the spoon with kitchen paper before sliding the eggs onto a plate. If the eggs have any straggly white bits around them, use kitchen scissors to snip them off then serve at once.